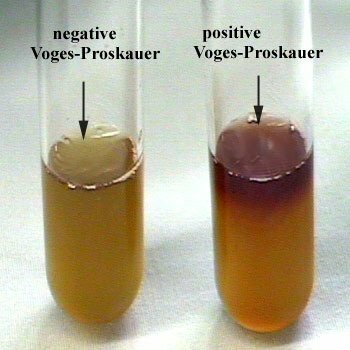 Voges-Proskauer is a double eponym, named after two microbiologists working at the beginning of the 20th century. They first observed the red color reaction produced by appropriate culture media after treatment with potassium hydroxide. It was later discovered that the active product in the medium formed by bacterial metabolism is acetyl methyl carbinol, a product of the butylenes glycol pathway. Pyruvic acid, the pivotal compound in the fermentative degradation of glucose, is further metabolized through various metabolic pathways, depending on the enzyme systems possessed by different bacteria. One such pathways result in the production of acetion (acetyl methyl carbinol), a neutral-reacting end product. Organisms such as members of the Klebsiella-Enterobacter-Hafnia-Serratia group produce acetoin as the chief end product of glucose metabolism and form smaller quantities of mixed acids. In the presence of atmospheric oxygen and 40% potassium hydroxide, acetoin is converted to diacetyl, and alpha-naphthol serves as a catalyst to bring out a red complex. Inoculate a tube of MR/VP broth with a pure culture of the test organism. At the end of this time, aliquot 1 mL of broth to clean test tube. Shake the tube gently to expose the medium to atmospheric oxygen and allow the tube to remain undisturbed for 10 to 15 minutes. A positive test is represented by the development of a red color 15 minutes or more after the addition of the reagents indicating the presence of diacetyl, the oxidation product of acetoin . The test should not be read after standing for over 1 hour because negative Voges-Proskauer cultures may produce a copper like color, potentially resulting in a false positive interpretation. Thank you so much for sharing comment/question. As per my knowledge most of the species of Aeromonas are non-lactose fermenting; however, some lactose fermenting Aeromonas spp. have been isolated. I am writing a Practical book for my students and find your blog on Biochemical tests very helpful. Please can you provide how best to reference you, especially the blogs from microbe online.com. Secondly, what is RYU stain as I will like to try some of the test for the students. I am a lecturer in a University in Nigeria. Sorry to be that guy, just almost put “acetion” in a report. Also appreciate this site, really helped. i am RIcky i would like to know what can cause a false negative result on the API 20 E VP test. Cause after adding the two reagents and waiting for 10mins as required, i had a pale pink colour which is normally supposed to be Negative but my colleaques are saying it was suppose to be positive. So i would like to know the possible mistakes i encounter during the praticals. Why alpha naphthol is used 1st and followed by potasium hydroxide in 2nd…..why we add in this order ,why not in opposite order..n what is the reason behind that…plz give an brief explanation…..
NOW PLEASE ANSWER ME WHAT ORGANISM IS THIS?